When the truck arrives it will park in the street. The delivery trucks will not drive down a driveway as due to weight, it could easily break it. Also, driveways are narrow and difficult for a large truck to navigate backwards. The vast majority of homeowners and contractors do not have access to a forklift. The way to unload a ton of decking is to “hand offload.” It sounds ominous homeowners are successful all the time. The way to look at it is take a board or two at a time. Pick up a board, hand it off. Pick up a board, hand it off. The boards come off fast. Questions or problems: If you are at all not sure, CALL ABS before the truck leaves and before you sign anything. Hand offload: You and your crew need to unload. If the driver helps, he will charge $100 that we will have to bill back to you. If your order is approximately 40/50 boards. This is about 10 minutes to unload. You just need a guy on the truck and a guy on the ground. The more people the better. Two works for a small load but 3 or more neighbors or a crew will make things easier on all. TIPS How I unload: I have used both Pickup Trucks and Vans. I just back them up to the truck and shovel the wood from the Freight Truck into a pickup or van. Then I just drive the van to the Job Site area. Be careful as you do not want to overload the pickup.If there is too much wood, move the pickup away and unload the balance of the order on the ground. If the driver trys to help, tell them your team can handle it. If the driver does help, BE SURE to tip him. I usually give the driver $20 if he helps. I have always tipped and never had the $100 “hand offload” fee. Here are some other items you need to be aware of.They are pitfalls that cause additional charges. We do not want to bill extra and suspect you do not want to pay extra. No Lift Gate. There is no lift gate ordered. The lift gate just gets in the way of unloading and the shipper charges an extra $75 if you request it. Lift gate charges are billed back to the customer. Detention: You and your crew will need to unload the boards to the ground. Then send the truck on its way. If the driver has to wait they will charge a Detention Fee of $100. Again, that is billed back to the customer. 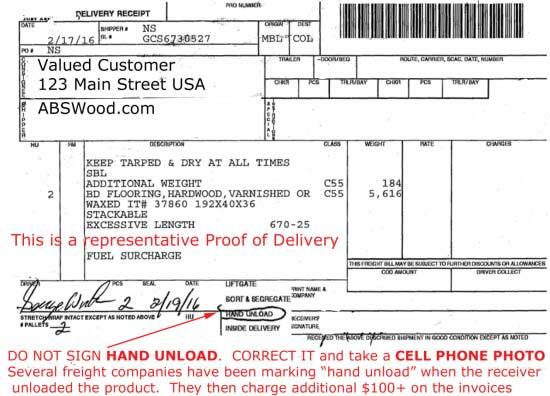 Extra Charges: Do not agree to sign a Proof of delivery that has Driver Unload or lift gate charges. The driver may just circle an item. Beware of this as they will charge $$$. ASK if there are any extra charges before you sign. Below is an example of a Proof of Delivery. Be careful there are no extra charges. This is a paper one. Some of the carriers have this on a tablet and it is harder to read. Damage: note it on the Proof of Delivery. If no damage is noted on the Proof of Delivery, the shipper will not pay any claims. You will not be able to collect for any damage and have to either live with the boards or buy additional one. USE YOUR CELL PHONE TO PHOTOGRAPH the Proof of delivery. Damage: Be sure to take photos. 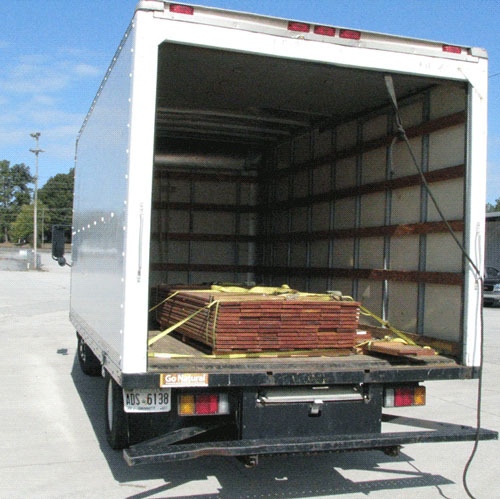 If the wood is a mess on the truck, take a photo of the wood before you unload it. Take photos of the pallet on the truck and also of any damaged boards. PHOTOS are critical to making a claim. Delivery: the scheduler will call to coordinate the delivery. Your or your designate will need to be there to sign and unload the truck.